I seem to have shoes on the brain this week for some reason. My mom said that as a child I went through a period where I would only wear red mary janes. I have a tendency to be particular so this is not all that surprising. My footwear preferences are no longer exclusive though I still have a fondness for red and mary jane styles. This is the only pair of red shoes currently in my closet and they make me happy. Was there anything that you constantly wore as a child and is it something you still like? Lovely red shoes. This color is great. It's a very nice style. I love those red shoes! I have been on the hunt for a pair I like for a while now but haven't found the right pair just yet. I think the things I wear now have changed a lot from when I wore as a child but maybe it's because I didn't have very much choice as a child. Hi lovely, I like it!! 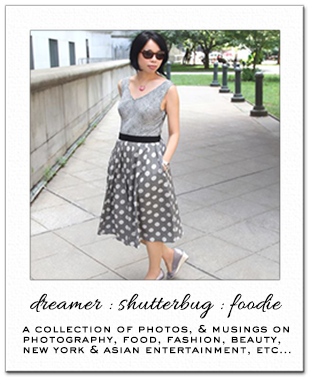 I follow you with Bloglovin now!! I use to have a red pair of shoes that I remember wearing all the time as a child too! These are very cute! I'm now following you back! You have such a great blog that I couldn't believe it when I saw you only have 52, now 53, followers... I hope more people will discover your amazing blog soon enough! Hmm... oh I always wore white sneakers. Every year my mom would buy me a pair of shoes for school, and I always wanted white. Then I would proceed to wear them everyday until it came time for summer and sandals! I remember this dark earth green jumpsuit which I bought for my own money and wore until I had to admit that I had worn it out! I was probably 6 or 7. I got the money when I found an expensive bracelet on the street and my parents managed to find the owner, who was so happy that she gave me money. I really cant remember what I wore. Ha ha. Such a great post, I like it!!! The flats are simply fab! Red is fun regardless of your age! I have a pair of MBMJ jellies I should break out soon! those might be the perfect red shoes! I think I pretty much lived in my keds for 5 years! Those shoes are so cute. I only wore dresses until 3rd grade. I had to be able to twirl in everything I wore, haha. Thank you Marcela! Same to you! Okay I'm glad it wasn't just me! They are adorable and can see why they are still in your closet!! Thank! You're so sweet! Your blog is amazing too! I liked white sneakers when I was younger too but they didn't stay white for long. I love your story! I bet that jumpsuit was cool. Thanks for sharing! Thanks! Looking forward to staying in touch with you! I'm starting to think I may not be the only one who loved red shoes as a child. Oh yeah I moved onto Keds eventually. LOL I can totally understand your resistance to skirts now :) My mom liked to put me in really short dresses for some reason and to this day, I don't own one that hits above the knee. Love the vintage style of these shoes, so pretty! The red of the shoes are nice. They're not so bright, but they stand out just nicely. I need to get myself a pair of red something. I've never been much of a color red type of person, but I should venture in the color red. Thank you very much for your sweet comment and following my blog!!! I like your blog, it's very beautiful (I strongly believe that blogs must be beautiful). I follow you back and hope you will continue visiting my blog, I always do if I follow a blog. Have a wonderful weekend and looking forward new posts from you! You should totally get yourself some red shoes. They really make a statement esp. if you keep your outfit neutral. I think it's like keeping a part of my childhood with me. It's funny how we can get away with crazy colorful things when we're kids but not so much when we're older. Your blog is great! I enjoy the way you write and find your life in S. Korea very interesting so I will def. continue visiting you as I also do that when I follow a blog. I really appreciate your kind words on my blog and look forwrad to staying in touch with you! Thanks! They are quite versatile. Funny! 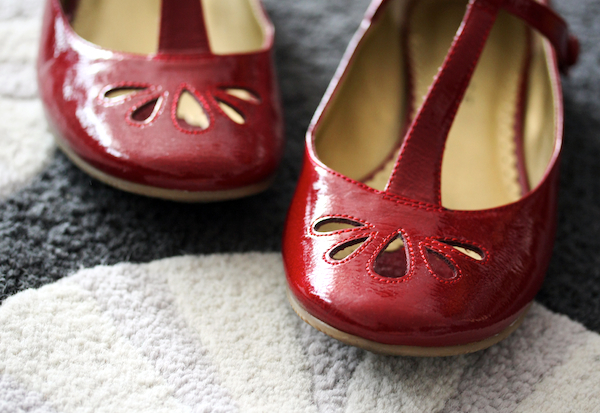 I was fascinated with my mom's heels when I was a kid and I also favor flats now as well. That red shoes how darling! I'd still wear flats these days, they were my faves since grade school, very comfy yet stylish. oh i love these pretty red shoes, so sweet! So adorable! I loved twirly dresses as a child and still do! I agree! Flats can be so comfy and stylish! I bet your pink ballerina slipper style shoes were fabulous! Twirly dresses are so girly! I love them too! I had a favorite blanket as well! Great shoes! Can I ask who makes them? I have a similar pair by Miu Miu, but these in red are adorable. And yes, Mary Janes are total nostalgia wear. Remember the Wizard of Oz? cute cute red mary jane. I absolutely love the retro vibe. Thanks! They're by Rampage and I got them for $30 a few years ago.